Being of African descent I’ve always been curious about the Kwanzaa holiday. What it means. How it’s celebrated. 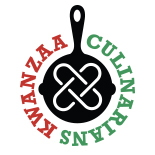 In researching there are seven principals that represents Kwanzaa. The very last principal in the Kwanzaa celebration is “Imani” in Swahili, which means “Faith” something we should all believe in on a daily basis. For me faith plays a major role in my own personal life. I believe in GOD and without the faith of believing in him I wouldn’t have made it this far throughout my life’s journey. I’m no stranger to economic hardship, the death of my first child, depression, childhood abuse, sexual assault… you name it, its happened in my life. However, the will to overcome those obstacles are what makes one rely on faith. Faith makes you stronger so when there’s a need to help others through similar situations you can be that testimony. Faith plays a huge role in the way I prepare food as well. There are so many traditional dishes that have been passed down from my Grandmothers and my Mother. However, to step away from that and create new traditions you will pass down to your own children and grandkids, that’s where faith comes into play. Not only are you persevering the traditions you’ve grown up with, you’re also creating new ones. If you ask me that last one alone took guts and faith, but nonetheless surprisingly delicious! They all taste like a holiday party in your mouth. Enjoy! The recipes below were created and tested on 6 drummettes each, however you can double, triple and or quadruple the recipes to your liking. Wash and dry the chicken drummettes. Salt and pepper as you desire. For these recipes I used approximately 1 tbsp each salt and pepper. If you choice to make more you will need to use more seasoning to your taste. In a deep fryer or medium to large saucepan fry wings until golden brown cooking all the way through. Remove from oil, drain and toss in prepared sauces below. Enjoy! 1. In a medium saucepan on medium-low heat, cook butter until golden brown. Do Not Burn! 2. After the butter has reached the golden brown stage, add in the dry seasonings. 3. Stir together and remove from heat. 4. Toss in wings, serve and enjoy! 1. Add all the above ingredients to a medium saucepan. 2. Bring sauce to a boil, cooking for 10 minutes and remove from heat. 3. Toss in wings, serve and enjoy! 1. Remove the pecan filling from the pie shells and add it to a small saucepan. 2. Add in the melted butter and cook mixture for 2-4 minutes. Remove from heat and toss in wings. 3. Top with pecan chips and enjoy! 4. Remember, these are surprisingly delicious. Latrice Fowler is the author of RaisingChefs.com. Follow her on Facebook and Twitter. Do you think the green beans on your plate have anything to do with the intimacy your willing to explore in your relationship? Shelley Chapman, The Food Relationship Coach™ does. "Your approach to food is your approach to life". That’s Shelley's philosophy and she teaches how people and food collaborate and conspire to either uplift or take power away from each other. Having once been a compulsive over eater and emotional eater, Shelley learned the hard way that it's now what we eat, but how we eat that affects how we show up in life. By using her innovative coaching program: Belly Breakthroughs, speaking and facilitating workshops, Shelley has helped transform the bodies and lives of women. One client wrote, "She is the perfect blend of your favorite homegirl and the wise sage woman. My work with Shelley has opened me up to the celebration of my body and sensuality". Her latest work, Tantric Tastes: Dessert for Lovers explores the relationship between sensuality and food and is an Amazon Best Seller. This entry was posted on December 31, 2011 by shelleychapman1 in 2011, Imani, Recipe and tagged chicken, holiday, Imani, Latrice Fowler, meat, RaisingChefs.com, Rosemary Brown Butter Drummettes, Spicy Cranberry Barbecue Drummettes, Sweet Pecan Pie Drummettes.